Synopsis, Our Opinion: An ELEGANT and bold Italian red that’s an outstanding value. 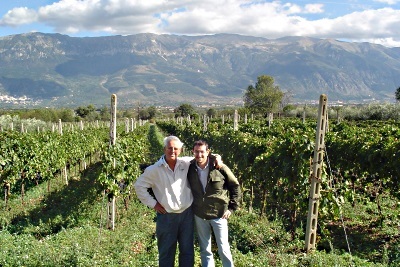 Producer/Winery: Praesidium winery; Agricola Ottaviano Pasquale; Prezza, Italy. 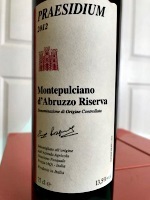 Geographic Appellation: Montepulciano d’Abuzzo Riserva; Abruzzo, Italy. Opened one hour before drinking. Clear, dark ruby color with a lighter rim. Vigorous leather, lavender blossoms and musty vegetative aromas with secondary whiffs of blooming Serviceberry (Amelanchier canadensis), ripe plum and current jelly. Smooth, fruity, solid medium body and a 150-grit texture. Rich and sophisticated plum and cherry flavors. Brisk acidity and bountiful round tannins that come alive at mid-palate and continue developing all the way through the long dry mineral finish. FANTASTIC Montepulciano d’Albruzzo. It had memorable aromas that dominated every sip from start to finish. The distinctive bouquet reminded me of the unmistakable smell of a freshly cut Tree of Heaven (Ailanthus altissima), if you’ve ever cut or chopped one you will never forget the odor…the aroma of this wine was that unique and distinctive!!! The smooth mouth-feel and explosive round-edged tannins were also distinctive and made the wine special. OUTSTANDING with the mushroom sauce meatballs and pasta, but equal or better sipping after the dinner. Vicky commented several times that it tasted like a wine costing twice the price we paid. An ELEGANT and bold Italian red that’s an outstanding value. Comments: Learn more about and their wines. Imported by: Rinascimento Wine Company; Los Angeles, California.